From permanently preserving the ‘Up’ house to a downturn in the real estate market, the fortunes of our city saw some big fluctuations. For the third year in a row, Seattle remains the country’s crane capital, with twice the number of cranes (65) as any other city except Chicago, which takes second place with 40. South Lake Union (17), downtown Seattle (14) and Capitol Hill (10) lead the current neighborhood crane count. After holding the “hottest housing market in the country” title for 21 months, Seattle’s real estate market cooled this summer, dropping Seattle to second place after Las Vegas. Why the dip? Higher inventory, fewer sales and rising mortgage rates. 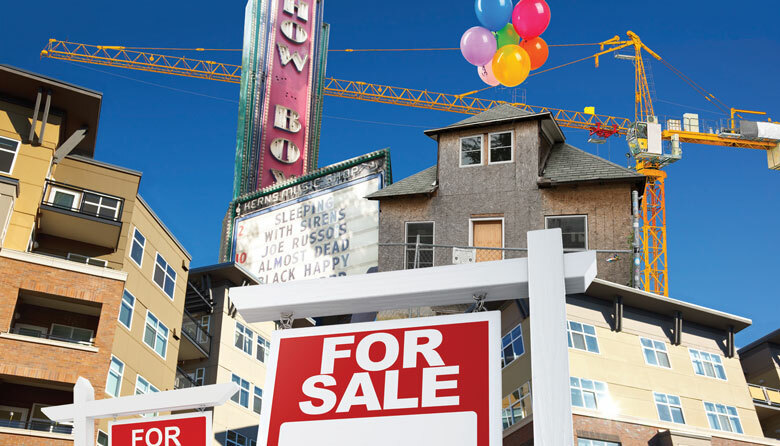 In July, a number of outlets report that the Showbox theater is slated to be replaced with a high-rise apartment complex. Soon after, the City Council votes to temporarily preserve the popular music venue. Fighting back, the family that owns the Showbox is suing the city, asking for more than $40 million unless the city retracts its decision. Things are looking up for the Edith Macefield House, that infamous, diminutive abode in Ballard that the late owner (for which the house is named) wouldn’t sell to developers. Developer Regency Center plans to integrate the structure into Ballard Blocks II, a mixed-use development now under construction. Seattle apartment rents dip for the first time in years, as new buildings continue to flood the market. While more and more of these apartments are sitting empty, snagging one is still no bargain: Average rentals across all unit types exceed $2,000 downtown and in South Lake Union. Transit was a mess this year, and it’s not getting better anytime soon. What goes up must come down, except the stalled escalators at the University of Washington light rail station. Three times last spring, riders waited an hour to reach the train platform. The Downtown Seattle Transit Tunnel also has had issues, as have escalators on Capitol Hill and SeaTac. The good news: Metro Transit, recently named the “best large transit system in North America” by the American Public Transportation Association, will offer more bus service to downtown and South Lake Union, thanks to a partnership with Amazon. The bad news: Metro can’t find enough drivers and has cancelled dozens of trips. Whose sidewalk is it, anyway? Who rules Seattle sidewalks? Bikes? Skateboards? Segways? People? Who knows? It’s hard not to notice all the moving parts packing the pavement—and the lack of city regulations addressing the problem. The latest out of Olympia: Electric bikes going up to 20 mph can share the sidewalks. Can’t find a parking spot? Turns out there are plenty in the city, 1.6 million to be precise, and the number is growing. But chances are, you’re not noticing them, since most are in public and private garages, according to a recent study, which also counts private driveways as “parking spots.” On-street parking makes up less than one-third of the city’s parking places.